Click here for the Amine-terminated Magnetic Beads. The thiol-activated magnetic product consists of super-paramagnetic beads which are functionalized with high-density thiol functional (2-pyridyl disulfide) groups. The beads are used to reversible couple thiol-containing ligands such as peptides, proteins, antibodies, and aptamers. 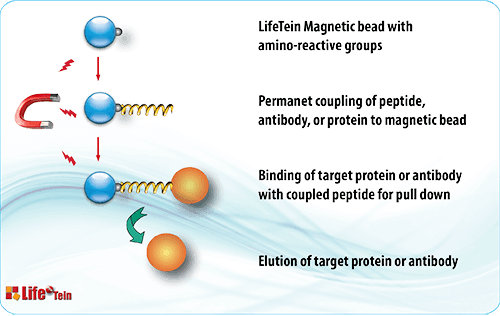 Subsequently, target proteins are affinity purified using magnetic separation technology. 1. Dissolve 1-10mg protein/peptide in 1ml coupling buffer. 2. If samples have already suspended in other buffer, dilute samples with equal volume of coupling buffer. Weight, suspend the magnetic beads with 20% Ethanol (Concentration: 30mg/ml), disperse the beads by vigorously vortexing and store at 4?C. 1. Transfer 30 mg Magnetic beads to a centrifuge tube. Resuspend the beads by adding 1 ml coupling buffer and mix the beads by vigorous vortexing for 1-2 minutes. 2. Place the tube on the magnetic separator for 1-3 minutes. Remove the supernatant while the tube remains on the separator. Remove the tube from the separator and resuspend the beads with 1 ml coupling buffer by vortex for 30 seconds. 1. Add protein sample to the washed magnetic beads and incubate for 60 minutes at room temperature with gentle rotation. 2. Washed the magnetic beads with 1ml Coupling buffer for four times as described. 3. Block the excess active groups on the beads by suspending the beads in 1ml Coupling buffer containing 8mg L-Cysteine•HCl and incubate 30-60 minutes at room temperature with gentle rotation. 4. Wash the beads with 1ml Washing buffer four times as described . 5. Resuspend the beads in PBS buffer containing 0.05% sodium azide and store at 4C. 1. Transfer optimal amount of the beads to a centrifuge tube. Place the tube on the magnetic separator for 1-3 minutes. Remove the supernatant while the tube remains on the separator. 2. Remove the tube and resuspend the beads with 5 bed bead volume of PBS buffer by vortex for 30 seconds. Leave the tube at room temperature for 1-3 minutes. Place the tube on the magnetic separator for 1-3 minutes. Remove the supernatant while the tube remains on the separator. 4. Add washed beads to crude sample containing target protein and incubate at room temperature or desired temperature for 1-2 hours (Lower temperature require longer incubation time). 5. Extensively wash the beads with 5 bed bead volumes of PBS buffer or 1M NaCl until the absorbance of elute at 280 nm approaches background level (OD 280 < 0.05). 6. Elute the target protein by appropriated methods such as low pH (2-4), high pH (10-12), high salt, high temperature , affinity elution or boiling in SDS-PAGE loading buffer. 1. Resuspend the magnetic beads with 0.1 M DTT (dithiothreitol) or Mercaptoethanol solution and incubate at room temperature for 30 minutes with gentle rotation. 2. Place the tube on the magnetic separator for 1-3 minutes. Remove the supernatant containing the released ligand to a new centrifuge tube while the tube remains on the separator. 3. Perform buffer change by gel filtration or dialysis to dissolve the ligand into desired buffer.